What is it about word art or word signs that make a space feel so cozy? Is it just me that feels this way? 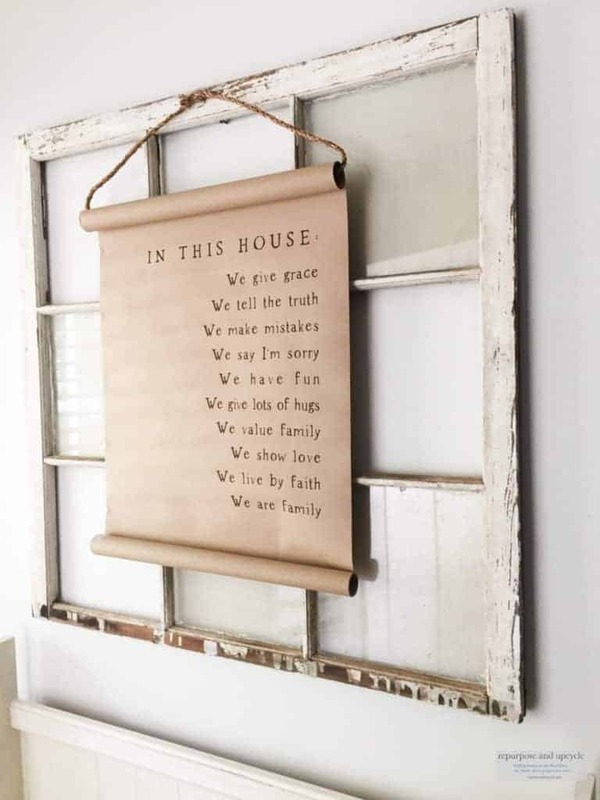 I’m guessing if you’re not into a modern farmhouse or farmhouse style you probably could care less about word decor or wall sayings. 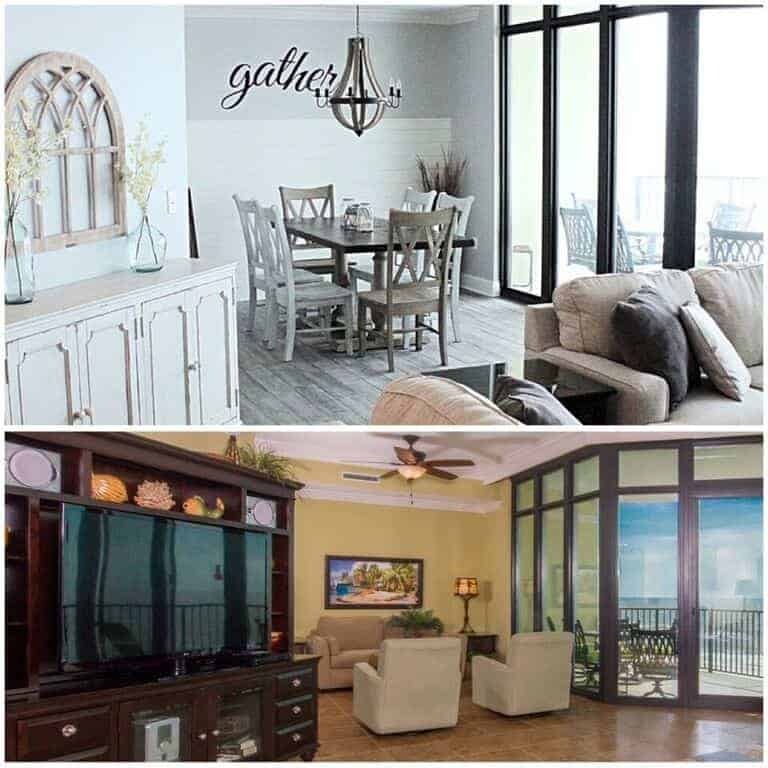 To me it personalizes a space and makes it feel like home. Anyone can buy pretty decor and hang random pictures, but I like to decorate with items that say a little something about us and our story. 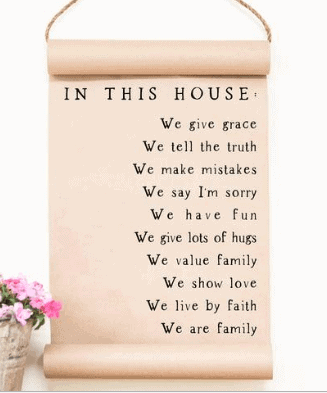 When I found this sign online I knew I had to have it for our rustic beach cottage entryway. I don’t share a lot about my faith, or about my family, but they are the reason behind everything I do. I try to keep this little blog about furniture flipping and home decor updates, but every now and then I like to share a little bit about me. In a nutshell, I believe I’m just a sinner saved by grace living by faith in this crazy world. Sometimes life can be more than we want to handle, but that’s why the good Lord sent his son to earth to die on the cross to save us from our sins. I realize every day is a gift and we are here for a higher purpose; and yes I believe that every one of us has a purpose. I try to find my purpose by following His will, whether that means sharing the love of Christ through staying at home with my babies or sharing it here with you! Whew, I did not mean for this post to get so deep nor did I intend to stand on the pulpit! All that to say I felt like this little sign by Smallwoods really sums up our values. I decided to layer it on the front of this antique window. I feel like the sign really personalizes the space and makes it feel more welcoming. What do you think? I think it adds dimension to our rustic cottage entryway. If you’ve been around here a while you might remember a little about that bench….. If not, let me show you the BEFORE picture below. This was a $10 thrift find. Can you guess what it is? It’s an old computer hutch. Lucky for me, it’s SUPER sturdy, so I knew I could use it as a bench. You can see more about this makeover and our modern farmhouse entryway from our previous home HERE. Once I placed the bench, the old vintage window and the scroll, I felt like this space was almost complete. A little greenery and it’s almost done! 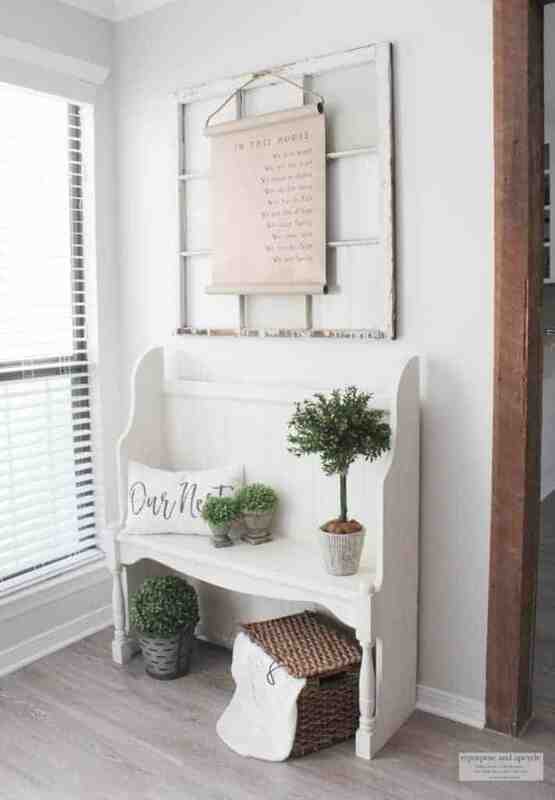 I think my favorite style is blending a little antique with a little rustic and a little farmhouse; there you have it, my rustic beach cottage entryway. 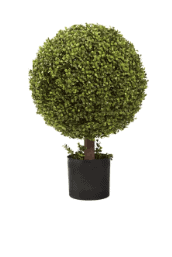 Check out how I created that DIY Topiary Tree with Boxwood Sprays. 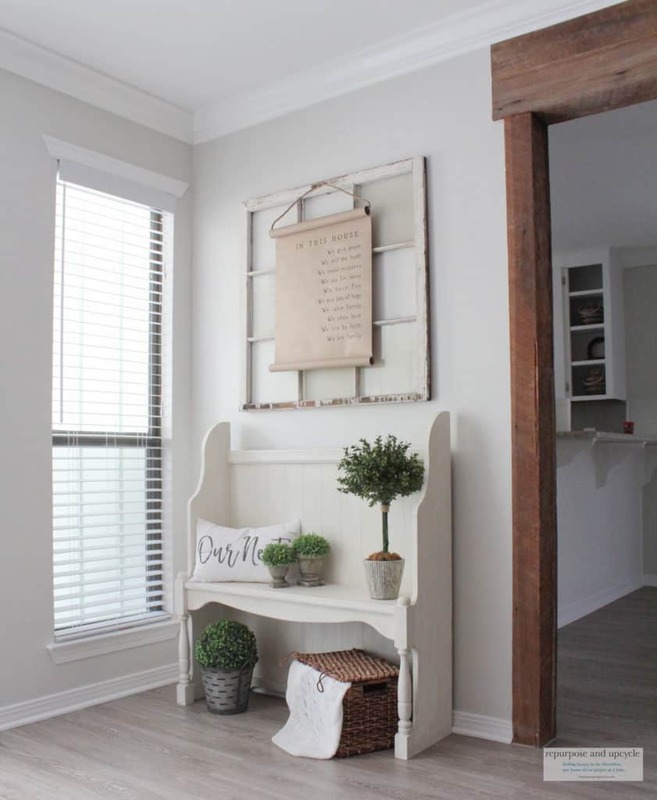 Modern Farmhouse Entryway with Thrifted Finds. Thanks for stopping in to see my new rustic cottage entryway. 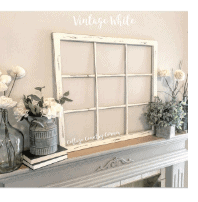 Stick around and check out more furniture flips or modern farmhouse style DIY’s. A few of these links are affiliate links. This means that if you purchase from these links I will make a small commission but in no way will you pay more for the product. I love it all! It is so nice to meet a sister in Christ, as well! Thanks for sharing your story. Thank you Candi! Have a lovely day. The composition and detail are warm and inviting. Pinned and shared. We share the same faith and it is good to let people know where you stand. I can do nothing without Christ in my life and I wonder how those that don’t have Him get through! Your sign is precious and looks wonderful in that corner. It is a great blend of all my favorite styles. I love it! reflects the values of our home as well. 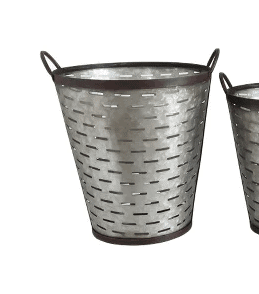 It really is the perfect addition to your space. 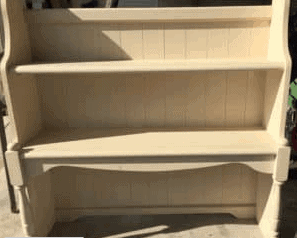 The hutch turned bench is awesome too. Thanks for sharing with SYC. 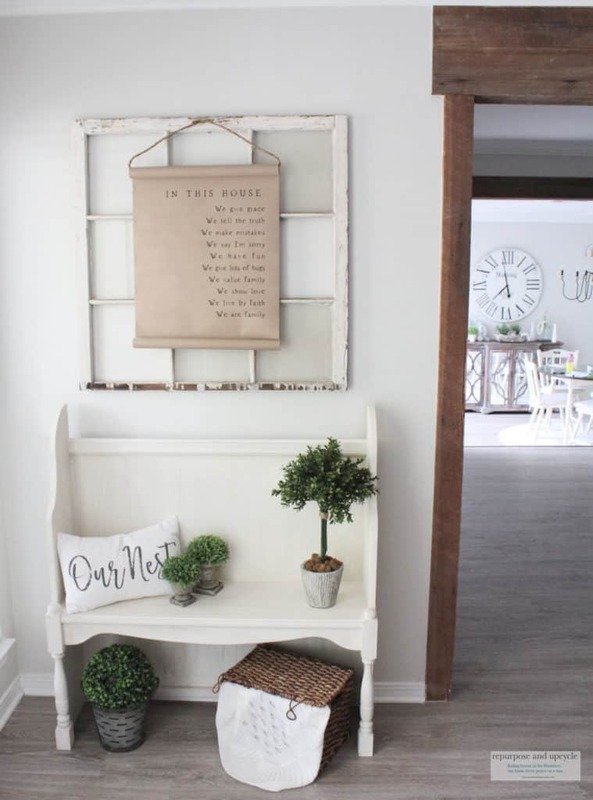 Loved this post and your openness and loved your entryway too. The word art is beautiful 😍. Found your blog when I linked up at April’s Hearth and Soul Link Up. So glad I did. Thank you Tracey! I hope you have a great weekend. Love how you made this bench. I would never have guessed it was from a computer hutch. Great job. And I love the old window. I am a sucker for old windows. Such a great project! It really gets my wheel spinning. Thank you for sharing at Inspire Me Monday. I wanted to let you know that you are one of my features this week. Come check it out at http://www.farmhouse40.com/inspire-me-monday-187 See you there! What a beautiful warm and inviting entryway! Love everything! Thank you so much for sharing your decorating with us over at Waste Not Wednesday! Lindsey, beautiful message and the hutch – oh, so creative (pinned)! Saw it featured on Dagmar’s link party, happy to find you!